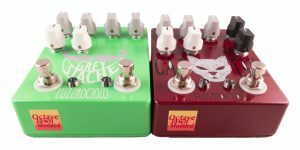 Fuzzrocious hasn’t been known to do many things the same way other companies do. This one is gonna buck the trend a little more and we hope that you’ll believe in us. The Octave Jawn is a polyphonic, digital, fast-tracking octaver. This means that it will track those arpeggios, complex chords, and noodles well. Yes, octavers are widely available, but where we turn left instead of right is that ours will be a drop-in mod. Octave Jawn is $100 on new orders and $125 on preexisting Fuzzrocious products that you already own! Yes, it’s a digital octave for $100!!! THIS SAVES SPACE ON YOUR PEDALBOARD AND IT’S CHEAPER THAN MOST OCTAVERS! Order starting on May 30 at http://fuzzrociouspedals.com or from one of our wonderful dealers/stores.